Are you looking for the best coffee maker on the market right now? There is no single best coffee maker – the concept is like looking for the holy grail! The simple fact of the matter is that the absolute best coffee maker for one person in one situation will not be close to the best coffee maker for someone else in their set of circumstances. You cannot say any one coffee maker is best… and for that matter you can’t say any 10 coffee makers are best either because they just aren’t in our opinion. Drip coffee has been around for a long time. Back in the day when coffee filters were just being invented coffee percolators were the mainstay in most US households. These days there is a dizzying array of drip coffee machines and almost all of them are excellent for certain types of people. Because we don’t believe in good conscious that we can recommend any one type of coffee maker over any other we want to persuade you to narrow your search a bit first. To do that our website features curated pages of some of the best coffee makers made by category. In those categories you will find our commentary on lists of excellent options for that particular category. Please start your search by selecting the kind of coffee maker you want and then do a deep dive. Choose from the list of curated pages below to find your best drip coffee machine. Coffee Makers Without Plastic Parts Are Just Better! These Coffee Makers with K Cup and Pot Brew Coffee Two Different Ways! The above list of coffee makers only encompass our pages on drip machines. 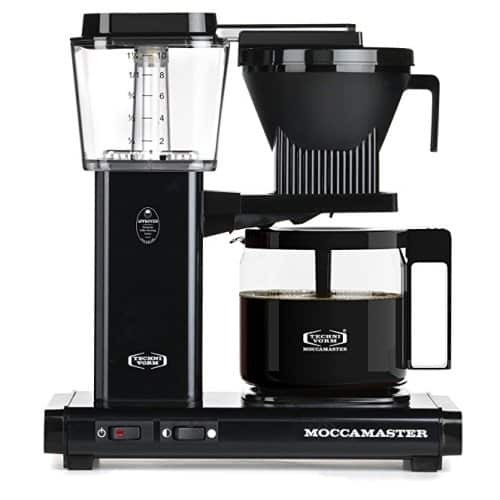 There are of course a whole bunch of other types of coffee makers to choose from, many are widely believed to make better coffee than drip machines can ever make. If you want to see a few other top choices then see our pages on french press coffee makers, moka pots, coffee urns, and percolators. You can also see our review of the extremely popular Chemex pour over coffee maker and the Aeropress which are excellent alternative coffee makers in their own right.